The date and time of your ceremony may be dictated by practicalities but there may also be a special date you want to commemorate – for example, the anniversary of when you first met, your birth date, etc. 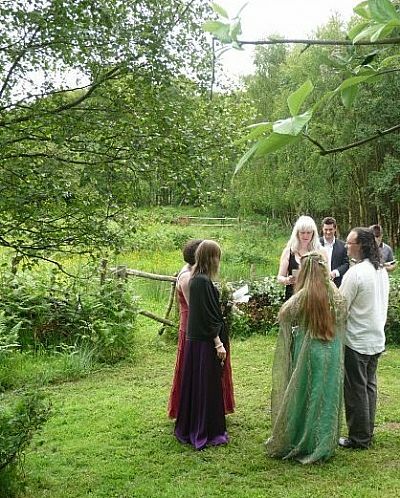 You may also want to have your ceremony at a particular time of year: Beltane (30 April/1 May) is a good time for weddings but many couples choose to get handfasted in spring or summer if they wish to hold their ceremony outdoors. Bear in mind considerations such as the weather and - if holding your ceremony in the west of Scotland the dreaded midges - and have another option available in case conditions are bad. The day and time of your handfasting may also be chosen according to astrological factors in which case it may be felt to be polite to ask the blessings of the deities/planets involved. I am happy to write and officiate at your ceremony but please note that all booking of and payment for venues and other organizational matters such as the essential arranging of marriage schedules and other legal documentation should be taken care of by yourselves. If you do not own the land on which you wish to hold your ceremony then you will need to contact the landowner to ask permission beforehand. For more information about the legal requirements for your wedding ceremony have a look at the next page or click here for the General Register Office of Scotland's website. There's some testimonials from happy couples here.